As you plan your outfits for upcoming holiday parties, don’t forget to consider festive hairdos. We stopped by a few salons to see how they are styling hair for the holidays, and five local experts gave us inspiration for looks to try this season. Whether you are a looking for a DIY option or a more elevated look with well-placed accessories, the experts are here to help. Not only do they give us inspiration, but they also walk us through why and how the hairstyles work for the holidays. They encourage us to tackle the looks ourselves but are only a phone call away should we need a helping hand. Which of these five hairstyles will your try for the holidays? “Accessories are a big thing right now,” Element Salon stylist Courtney Cluckey explains. “They add a little shine and sparkle, which everyone wants during the holidays.” A simple accessory can spruce up a plain hairstyle and take it to the next level. This season, toss an accessory into your hair, and wow other party-goers with your easy look. To master a simple hairstyle, Courtney reminds us to create texture. “Texture spray makes it look not-so-perfect,” she says. A simple twist is elevated by an eye-catching accessory. Deidre DeFelice, The Blowout Co. If you are in the mood for an updo but don’t want to look too done, opt for a dressed up pony. “It is super easy to accomplish at home and works on most hair lengths,” Deidre DeFelice, Director of Operations for The Blowout Co., assures us. She suggests starting with curls or waves in your hair before teasing the crown and bobby pinning it in a “pouf.” Then, pull a section from each side and secure with a clear elastic. “Create a topsy tail, like we all used to do back in the day, then pull one more section from each side and create one more topsy tail. The rest of your hair just hangs down and can be finished off with a dry texture spray. Bedroom Hair by Kevin Murphy is my favorite and is available at all Blowout Co. locations for $30,” she continues. She also reminds us that leaving a few strands out around the face will soften the look a little bit. The folks at The Blowout Co. promise us that even though this hairstyle looks like it takes an expert to achieve, we can tackle it at home with flawless results! The simple detailing of this hairstyle makes it perfect for a holiday event of any kind. Once the braids are in place, use texturizing spray and a comb to create volume and texture. Then, curl the remaining strands in alternating directions. His products of choice are Dry Texturizer by Davines and Davines’ Volume Creator brush. “If you want a more polished look, you can use a shine spray to add extra glisten,” he explains. This versatile look is sure to impress your fellow party goers. Textured and a bit messy, this look only gets better as the night goes on. Finish off the look with a barrette! Kim Hunter, the owner of True Blue Salon, reminds us that almost anyone can tackle a messy braid at home, and you can make it holiday-ready by adding ornaments and a bow. The smaller the ornament, the better the look — in our opinion. Unless you are attending a themed party, we don’t want you to look like a Christmas tree. Finish the braid off with a bow on the end and call it a day! 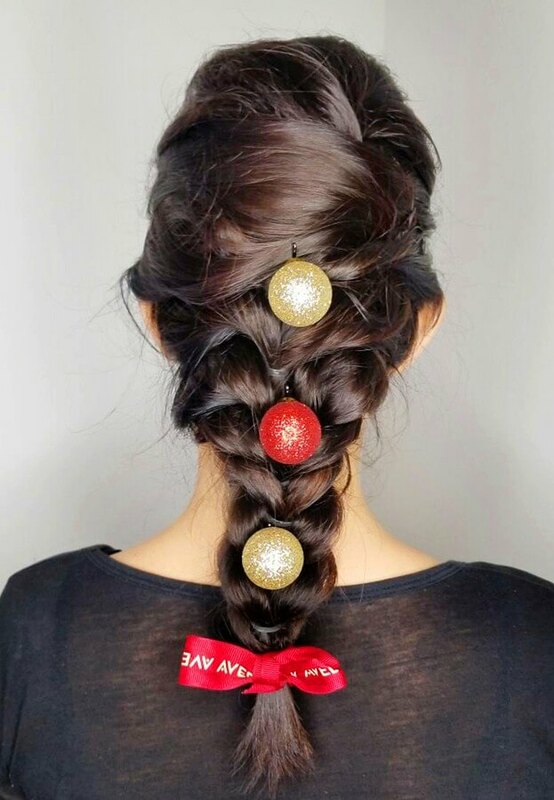 Get festive by adding holiday accessories to your hair! As said above, the smaller the ornament, the better the look. If ornaments in your hair are not your thing, note how pretty this twist-braid is on its own with the more purposeful hairstyle at the crown. Use these photos as inspiration to tackle your holiday hairstyles. If you need help, just call the experts! Find more style suggestions and inspiration here!